Posted in UBC Okangan Dorm? adios fido - March 8, 2011, 5:09 p.m. Probable new UBC student: rental housing advice - June 22, 2010, 9:25 p.m.
See my previous posts for about the Thunderbird area. All in all, it was nice. Totally unlike undergrad res. As for the units, from what I recall all studios were on the ground level. I would personally pay the extra for a 1 bedroom. I didn't even like my living room because it felt too much like a fishbowl that everyone could see into… a studio is pretty much my living room but with a bed in it. The studio apartments are likely treated better than the 4 person unit I was in so your floors and cabinets won't be worn out. All the inside of Thunderbird was painted last year. Floors are being replaced 10 units every 3 months or so. UBC Okangan Dorm? - June 21, 2010, 9:19 p.m.
And read the residence contract in whole, it's good stuff to know. It's not your standard rental agreement. such a nice day - April 28, 2010, 8:14 p.m.
Pita Pit is around the corner from McD's, next to Staples. Allison Rd [HTML_REMOVED] Dalhousie. Probable new UBC student: rental housing advice - April 2, 2010, 11:33 a.m. Anyone stayed or know anyone who has stayed at Green College residence or St. Johns College residence? They seem like a really good setup. Had a happy friend in Green College. Don't know anyone in St. John's, but the location is nice (except that it is a bit close to the tamer of the two first year residences). I miss being in that pocket of campus because it was nice and close to the beach and you got that wonderful breeze. Probable new UBC student: rental housing advice - April 1, 2010, 6:21 p.m. I'm in the Thunderbird residence at UBC. It's mostly grad students around here, and very quiet. Overall it's a pretty good deal. With Save-On-Foods now on campus Thunderbird is only a 15min walk away from food. We used to be 10min walk and 10 min bus ride from a disgusting Safeway. Congratulations on your acceptance! I got into an MEng but will be applying for deferral… need a break from UBC. Credit Card Chips - March 7, 2010, 10:40 p.m.
Then it is NOT RFID. The gold squares are contacts that need to be inserted into a reader to get the information. Info stored on the card is transmitted to the data center and decoded there (not at the store's reader). I don't think there's much, if any, RFID used in Canada yet. 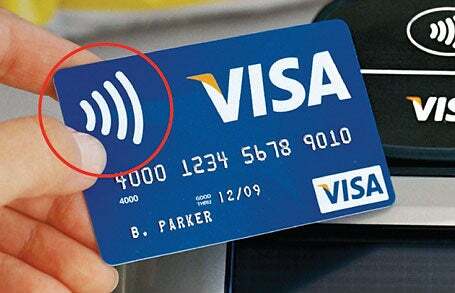 Non-RFID chips are just starting to penetrate the market. Also, I'm pretty sure you will only be issued a RFID card if you ask for it (for now, anyway). Bigger picture, there are all sorts of transactions that don't use the chip or your signature (gas station pay at pump, internet purchases), so focusing on this one issue is a bit over the top IMO. Left my macbook on sleep for a week, battery toast. Boooo! - March 1, 2010, 7:46 p.m.
My 1st gen Macbook was once slept for long enough to put the battery in a deep discharge state where the Power Management Unit could not muster the power to boot up and accept a charge. This was a common problem for a certain batch of batteries. I was still within my 1 yr warranty so I got a replacement in 17 days (dropping the battery off at a dealer no less)… 17 days without a battery, one MagSafe disconnect from losing data. Recommend me a laptop. - Jan. 18, 2010, 10:21 p.m.
Just got my ASUS UL30VT-X1 for $900 and it's a deal when you compare it to a MacBook Pro 13" but almost 2x your price range. How important is battery life and size/weight for you? blackberry curve - Aug. 25, 2009, 8:35 a.m.
Rogers sells a locked down version now, or you can join the developer program and buy one unlocked. I think it ran my friend about $750.